This article is about a fangame that has ceased production. No further work is being done on this project, and a release is not likely. DAIRANTO! Mario Bros. DDX is a collaboration fangame based on the original Mario Bros.. It was planned to have a lot of levels based off of different games, and a multitude of characters, even some outside of the Mario franchise. At one time, the fangame was scrapped, since Mit lost contact with Mr. Yoshbert, and possibly because of how ambitious the plans were. A demo of the game was released as part of a booth for the Nintendo Community Fangame Convention 2014 and the Nintendo Community Fangame Convention 2015. On the MFGG Awards of 2014, DAIRANTO! Mario Bros. DDX tied for Best Demo and won Best Sprites. It was nominated for Most Anticipated. 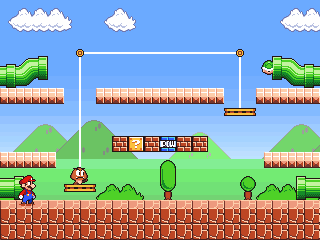 Each level is fundamentally based off of the classic Mario Bros. stage, however many of them have new gimmicks, levels, and stage layouts. Your character runs around the stage, and jumps underneath a set of floors. If an enemy is on that floor, it is flipped upside down and your characters can kick it by moving onto it. New enemies come out of the pipes for you to defeat. There is also a POW Block that, if hit, knocks over all enemies in the screen. In addition to a one-player mode, 4-player local multiplayer was planned. DAIRANTO!! Mario Bros. DDX was going to have a large amount of characters and alternate color palettes. Not many are known, however. A mockup of the character select screen. A mockup of of the Subcon stage. This page was last edited on 29 December 2016, at 21:17.